Product code: ES8335 Categories: Art Deco, Art Deco Pendant. 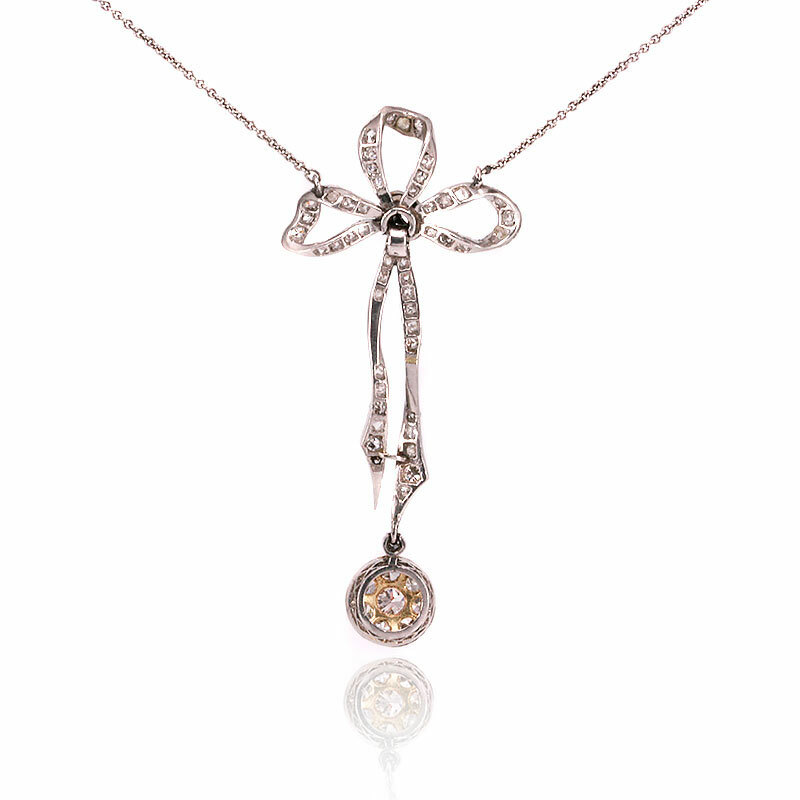 Here is a breathtaking Art Deco diamond pendant set with a bow from the 1920’s that will capture the eyes of everyone who sees it, and will transport you back to the wonderful hedonistic era that was the Art Deco era. Hand made in platinum and 18 carat yellow gold, at the bottom of the pendant is a cluster of European cut diamonds that then leads so delicately up to the bow at the top. However this piece has been so ingeniously made with the platinum “ribbons” hanging down from the bow emulating how a silk ribbon would twist and turn on its own accord. With an additional fifty two more diamonds in the pendant with the larger ones being more European cut diamonds and the smaller ones the delightful rose cut diamonds, the total diamond weight in this piece is 0.98 carats. The sparkle from this piece is incredible and will certainly get the attention that it rightly deserves no matter where it is worn. With the bow section measuring 5cm in length by 2.4cm across, laid out from end to end it measures 45.5cm and is fitted with its original hand engraved box clasp with safety catch. There is no doubt that this is an exquisite piece of jewellery and one that showcases the fine quality of what could be made all those years ago. This Art Deco pendant was hand made in platinum and 18 carat gold. 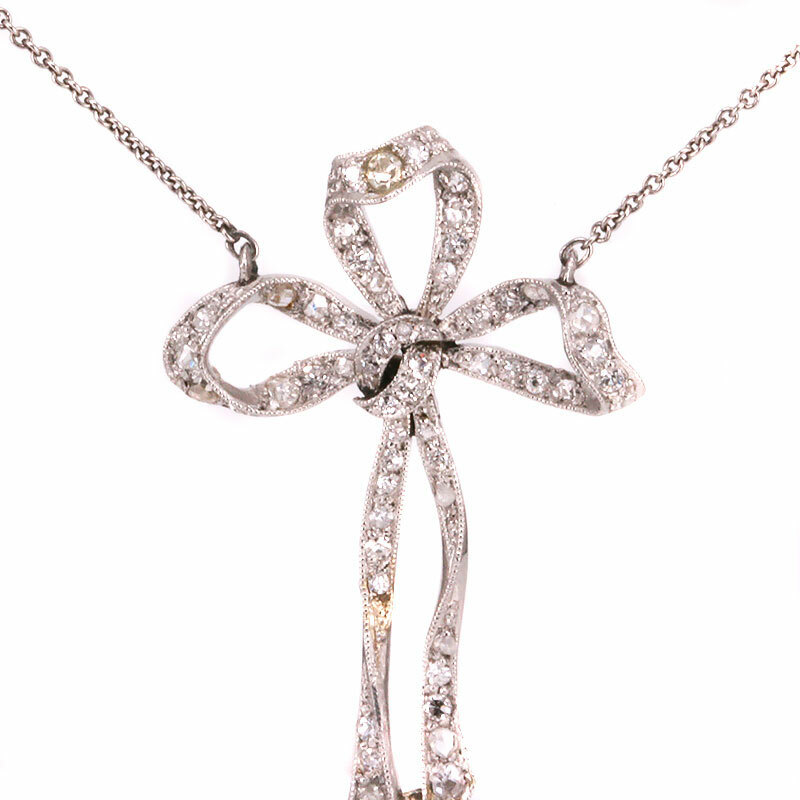 Set with rose cut diamonds and European cut diamonds, it sits perfectly on the neck for all to admire.